Milan: Inter Milan were held to a goalless draw at Atalanta on Saturday, missing the chance to move third and back into the Champions League places ahead of AS Roma and Lazio. 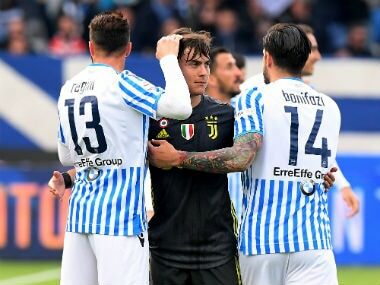 Juventus and Napoli are on course for the first two Champions League spots with three teams fighting for the two remaining with Inter, Roma and Lazio now all on 60 points. Inter have now gone three matches without a win and remain fifth with Lazio and Roma going head to head in the Roman derby at the Stadio Olimpico on Sunday. "We don't have a problem," insisted Inter coach Luciano Spalletti with top scorer Mauro Icardi again pinned back for the club's third Serie A game without scoring. "You look only if (Mauro) Icardi and (Ivan) Perisic don't score but we created chances and we were playing right until the end in a very difficult field." Atalanta dominated the first half with Papu Gomez missing an early chance sending the ball wide after five minutes. Inter goalkeeper Samir Handanovic did well to clear a header from 19-year-old Gambian Musa Barrow, who was making his first Serie A start, with Perisic denied by Atalanta's Etrit Berisha after half an hour. Inter got more into their stride in the second half with Icardi setting up Perisic only for Hans Hateboer to slide in to block. Rafinha fired over the bar and was promptly substituted by Eder. 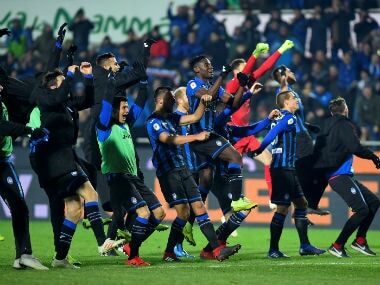 Atalanta showed signs of fatigue late in the game but held off as Inter pushed for the winner with Perisic and Roberto Gagliardini both off target. Atalanta move up to eighth, three points off the Europa League places. 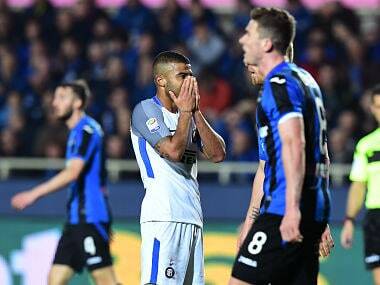 "Overall I think it's a fair point, even if neither side is happy with the result," said Atalanta coach Gian Piero Gasperini. Torino also suffered a setback in their push for European football next season with a goalless draw at 10-man Chievo to end their three-match winning streak. Defender Mattia Bani was sent off two minutes from time for a foul on Kevin Bonifazi, but the side from Verona held on for a point in their battle against relegation. A minute's silence was held before the game for Italian defender Sauro Toma, the only surviving member of the legendary Grande Torino football team, who died on Tuesday aged 92. He escaped the Superga air disaster due to a knee injury on May 4, 1949, when the flight returning from a friendly game in Lisbon crashed killing all his teammates. Both sides had chances to break the deadlock with Torino's Daniele Baselli's searing effort flying wide, while Chievo's Fabrizio Cacciatore missed when alone in front of an open goal after 75 minutes. Torino lost Nicolas Nkoulou to a muscular problem with Bani's header from a corner flying over the bar. Torino pushed for the late winner with an Adem Ljajic effort cleared, leaving the visitors 10th — six points off the Europa League places — with six games left this season. Chievo are three points above the drop zone, with relegation rivals Cagliari jumping ahead after condemning Udinese to a ninth straight defeat. 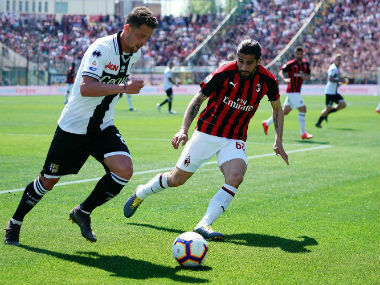 Kevin Lasagna had put Udinese ahead after 10 minutes in Sardinia but Leonardo Pavoletti pulled the hosts level on 21 minutes. Defender Luca Ceppitelli headed in the winner six minutes from time to secure a vital 2-1 win for Cagliari, who are a point behind Udinese, and push them five points clear of the bottom three. "This team is afraid of losing and when it goes in front gets afraid of an equaliser. It's afraid of everything," said Udinese coach Massimo Oddo. A first-half Daniel Bessa header gave Genoa a 1-0 win at home which ended Crotone's revival after last week's victory over Bologna. Genoa midfielder Iuri Medeiros had seemingly earned an early penalty but was instead booked for simulation after his dive was seen by the video assistant referee. But Medeiros then set up Bessa for the only goal after 28 minutes, to all but assure Genoa of another season in the top flight.